Owning velvet pants and skirts can be quite challenging as this type of material requires care to ensure it lasts a long time. Hanging velvet pants and skirts can be difficult as velvet can be slightly slippery and fall off the hangers or start to stretch from the weight of the cloth. If you want to properly hang your precious velvet pants and skirts then there are a few easy to follow methods that you can use to ensure that your clothes stay put and maintain their shape in the closet. Make some room in your crowded closet for your velvet pants and skirts. Throw out or donate old clothes that you are not wearing or do not need anymore. Depending the amount of velvet pants and skirts that you own, clear out enough space. Once you have made some room for your velvet clothes, it is time to organise them properly. Make different stacks of your velvet clothes based on size or length to help you stay organised. Go to the hardware store and purchase a packet of padded hangers. 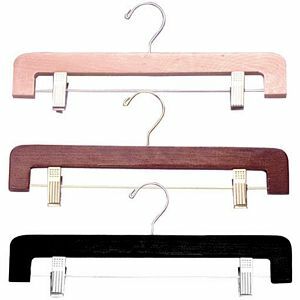 These hangers are designed for hanging velvet clothes as they grip the cloth properly without damaging it. Be sure to buy enough padded hangers according to your needs. You can also buy different sized padded hangers for large velvet items in your wardrobe. Padded hangers are slightly more expensive than other types of hangers available in the market. There are many different types of hangers available in the market. If you do not want to buy padded hangers then you can always look in to using hangers that have clips on them. These types of hangers are relatively inexpensive and very effective at holding velvet clothing in place. The clips can be moved according the width of the velvet garments. Remember to make sure that the clamps are flat and do not have any sort of grooves in them which can potentially cause serious damage to your velvet garments. Curved hangers are also available that allow you to hang your velvet clothing quite easily. These types of hangers are available at most hardware or convenient stores. For large velvet items you can purchase and use plastic garment bags. These are simple to use as all you have to do is place your velvet garment inside and zip up the bag. These plastic garment bags attach to any large size hanger and keep your clothes clean and free from stretching.